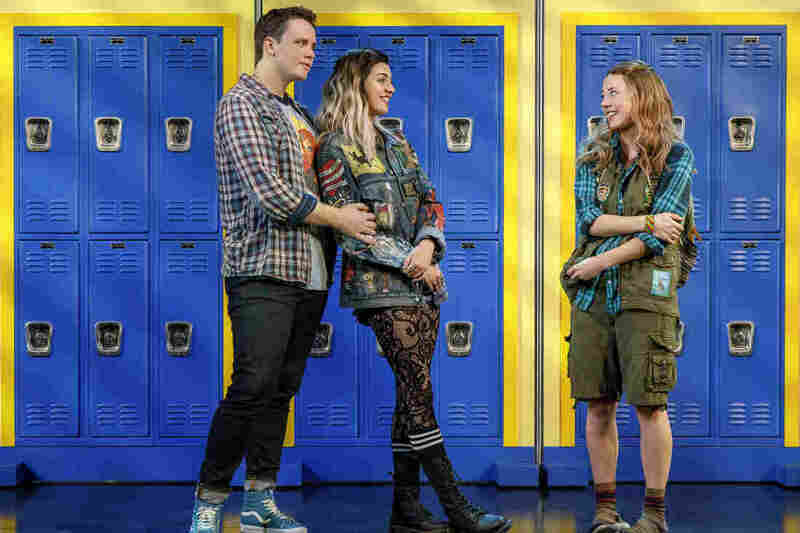 On Broadway, They Wear Pink: 'Mean Girls' Is Now A Musical A lot has changed since Mean Girls came out in 2004, but Tina Fey points to one reason the story still holds up: Older women and teens can both see themselves playing out their worst behavior. Cady (Erika Henningsen, left) wears pink along with fellow Plastics Gretchen (Ashley Park), Regina (Taylor Louderman) and Karen (Kate Rockwell) in the musical Mean Girls. For a lot of people, when they hear "fetch" and "Is butter a carb?" one thing comes to mind: Mean Girls. The 2004 movie was so influential that screenwriter Tina Fey and producer Lorne Michaels figured, why not a musical? Fourteen years later, it's opening on Broadway. If you're not familiar with Mean Girls, here's a quick back story: In the early 2000s, Tina Fey read Rosalind Wiseman's nonfiction book Queen Bees and Wannabes, about the drama of teenage girls and their often dysfunctional friendships. Fey was struck by the power some girls wield over others. She says, "The thing that I was so drawn to was they were insidious in their intent, but also so fascinatingly clever. ... You had to kind of admire the intelligence and power of it. At the same time, it has to stop. It was like a book full of Bond villains." Villain No. 1 in Mean Girls is Regina George, the hot blonde who everyone wants to impress, despite her evil streak. Queen bee Regina and her wannabes are in a clique known as the Plastics. (Every Wednesday, they wear pink.) Cady, the new girl, wants in. And then there's Janis, the revolutionary in the story. She's an artist who was hurt by her one-time friend Regina and wants nothing to do with the girls who wear pink. Damian (Grey Henson) and Janis (Barrett Wilbert Weed) befriend Cady (Henningsen) before she joins the Plastics. Fey says, in high school, she was a little bit of each character. "I was a good student, active in choir and editor of the newspaper and played one sport. But at the same time, I was consumed with jealously of people who I thought had a life better than what I had. And I think that it is self-poisoning in that way, and I think I didn't really fully understand that, and that my kind of poisonous sense of humor probably stressed out other people. I didn't understand that until I was about 30 years old." Fey thinks that's one of the reasons Mean Girls still holds up: Older women and teens both see themselves playing out their worst behavior. The music for Mean Girls was composed by Fey's husband, Jeff Richmond, who also had to get in touch with his inner teenage wannabe. He played the sax in marching band and still remembers a particular group of girls. "They were the cheerleaders, and they were powerful," he says. "And you just kind of wanted to — 'Boy, if I could just make them laugh at something I do, I think that's going to get me in.' "
That is the fate, times 10, of the character Gretchen, a Plastic who is desperate to please Regina after she snubs her. Lyricist Nell Benjamin thought a lot about Gretchen's fragility when she wrote the songs for Mean Girls. She describes it as being "aware that things are not right with the relationship you're in, but you don't know how to fix it." My body, face, my hair. Tell me like you care. I could listen to you like a fool all night. "The song is just an exploration of how do I make myself better?" Benjamin says. "How do I make my friend like me? And the answer is, of course, if they don't like you, they're not your friend. But in high school, who knows that?" Tiny Fey (left) wrote the book for the Mean Girls musical, Jeff Richmond wrote the music and Nell Benjamin wrote the lyrics. Fey says the song captures the female experience, and she credits Richmond and Benjamin with pulling that off. "[He] and Nell talked about it being a love song not unlike 'It Had To Be You' — if you listen to 'It Had To Be You,' it's about a terrible relationship. ... I'm not happy with you, but it had to be [you]. And so those early friendships, when they break up, are devastating." The world has changed so much since Mean Girls first came out — in the movie, only one girl had a device and it was flip phone. The musical made adjustments to account for social media and how it affects girls' lives. Fey says, "It's sort of like the difference between the Civil War and a modern-day war where the battles are drawn, but the weapons are just so much stronger and more devastating." Rosalind Wiseman, who wrote Queen Bees and Wannabes, says girls' friendships will forever be fraught. "Girls are still really focused on pleasing each other," she says. "The legacy of those issues really follows girls into their adulthood in their work, in their relationships. And I think a lot of women can relate to it, and it's why so many people related to Mean Girls." Fey has been working on the musical version for the past five years, before the #MeToo movement really took off. She says there's still a lot of work to do. "As great as things are going, you still have sometimes people going, 'I don't believe her,' or 'I don't like the way she did it,' and 'She should have spoken up sooner.' And we're still finding a way to blame other women for the actions of men." Fey doesn't want to hit people over the head with these ideas in Mean Girls the musical, but she hopes mothers and daughters will see the show together. It'll give them plenty to talk about afterwards. Rose Friedman edited this story for broadcast, and Nicole Cohen adapted it for the Web.